a. The Zimbabwean dollar is no longer in active use after it was officially suspended by the government due to hyperinflation. The United States dollar (US$), South African rand (R), Botswana pula (P), Pound sterling (£), Euro (€), Indian rupees ( ), Australian dollars (A$), Chinese yuan (元/¥), and Japanese yen (¥) are now used instead. The United States dollar has been adopted as the official currency for all government transactions. Zimbabwe , officially the Republic of Zimbabwe, is a landlocked country located in southern Africa, between the Zambezi and Limpopo rivers. It is bordered by South Africa to the south, Botswana to the southwest, Zambia to the northwest and Mozambique to the east. The capital is Harare. Zimbabwe achieved de jure sovereignty from the United Kingdom in April 1980, following 14 years as an unrecognised state under the conservative white minority government of Rhodesia, which unilaterally declared independence in 1965. Zimbabwe has 16 official languages, with English, Shona and Ndebele being most common. The present territory was first demarcated by Cecil Rhodes' British South Africa Company during the 1890s, becoming a self-governing colony as Southern Rhodesia in 1923. President Robert Mugabe is head of state and government, and commander-in-chief of the armed forces. Renowned as a champion for the anti-colonial cause, Mugabe is also viewed as authoritarian responsible for Zimbabwe's problematic human rights record and substantial economic decline. He has held power since internationally recognised independence in 1980: as head of government since 1980 and head of state since 1987. The name "Zimbabwe" is based on a Shona term for Great Zimbabwe, an ancient ruined city in the country's south-east whose remains are now a protected site. There are two theories on the origin of the word. Many sources hold that the word is derived from dzimba-dza-mabwe, translated from the Karanga dialect of Shona as "large houses of stone" (dzimba = plural of imba, "house"; mabwe = plural of bwe, "stone"). The Karanga-speaking Shona people are found around Great Zimbabwe in the modern-day province of Masvingo. Archaeologist Peter Garlake claims that "Zimbabwe" is a contracted form of dzimba-hwe which means "venerated houses" in the Zezuru dialect of Shona, and is usually applied to chiefs' houses or graves. Zimbabwe was formerly known as Southern Rhodesia (1898), Rhodesia (1965), and Zimbabwe Rhodesia (1979). The first recorded use of "Zimbabwe" as a term of national reference was in 1960, when it was coined by the black nationalist Michael Mawema, whose Zimbabwe National Party became the first to officially use the name in 1961. The term Rhodesia—derived from the surname of Cecil Rhodes, the primary instigator of white colonisation of the territory during the late 19th century—was perceived as inappropriate because of its colonial origin and connotations. According to Mawema, black nationalists held a meeting in 1960 to choose an alternative name for the country, and the names Machobana and Monomotapa were proposed before his suggestion, Zimbabwe, prevailed. 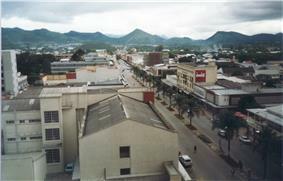 A further alternative, put forward by nationalists in Matabeleland, had been "Matopos", referring to the Matopos Hills to the south of Bulawayo. It was initially not clear how the chosen term was to be used—a letter written by Mawema in 1961 refers to "Zimbabweland"—but "Zimbabwe" was sufficiently established by 1962 to become the generally preferred term of the black nationalist movement. In a 2001 interview, black nationalist Edson Zvobgo recalled that the name was mentioned by Mawema during a political rally, "and it caught hold, and that was that". The name was subsequently used by the black nationalist factions during the Second Chimurenga campaigns against the Rhodesian government during the Rhodesian Bush War. The most major of these were the Zimbabwe African National Union (led by Robert Mugabe from 1975), and the Zimbabwe African People's Union, led by Joshua Nkomo from its founding in the early 1960s. From about 1300 until 1600, Mapungubwe was eclipsed by the Kingdom of Zimbabwe. 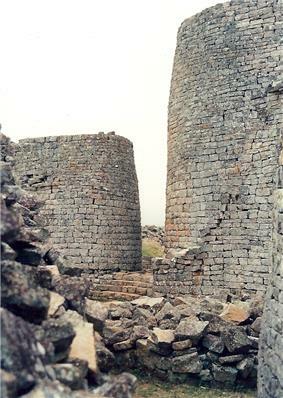 This Shona state further refined and expanded upon Mapungubwe's stone architecture, which survives to this day at the ruins of the kingdom's capital of Great Zimbabwe. From c. 1450–1760, Zimbabwe gave way to the Kingdom of Mutapa. 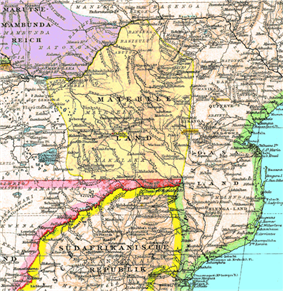 This Shona state ruled much of the area that is known as Zimbabwe today, and parts of central Mozambique. It is known by many names including the Mutapa Empire, also known as Mwene Mutapa or Monomotapa as well as "Munhumutapa," and was renowned for its strategic trade routes with the Arabs and Portugal. Eventually, however, the Portuguese sought to monopolise this influence and began a series of wars which left the empire in near collapse in the early 17th century. As a direct response to increased European presence in the interior, a new Shona state emerged, known as the Rozwi Empire. Relying on centuries of military, political and religious development, the Rozwi (meaning "destroyers") expelled the Portuguese from the Zimbabwean plateau by force of arms. They continued the stone building traditions of the Zimbabwe and Mapungubwe kingdoms while adding muskets to their arsenal and recruiting a professional army to defend recent conquests. After losing their remaining South African lands in 1840, Mzilikazi and his tribe permanently settled the southwest of present-day Zimbabwe in what became known as kraals, similar to those of Shaka, which was stable enough to repel further Boer incursions. Mzilikazi died in 1868 and, following a violent power struggle, was succeeded by his son, Lobengula. In the 1880s, white colonists arrived with Cecil Rhodes's British South Africa Company (BSAC). 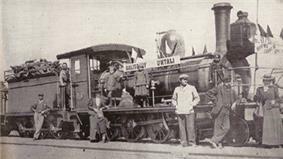 In 1888, Rhodes obtained a concession for mining rights from King Lobengula of the Ndebele peoples. He presented this concession to persuade the government of the United Kingdom to grant a royal charter to the company over Matabeleland, and its subject states such as Mashonaland as well. In accordance with the terms of aforementioned concessions and treaties, mass settlement was encouraged, with the British maintaining control over labour as well as precious metals and other mineral resources. In 1895 the BSAC adopted the name "Rhodesia" for the territory, in honour of Rhodes. In 1898 "Southern Rhodesia" became the official denotation for the region south of the Zambezi, which later became Zimbabwe. The region to the north was administered separately and later termed Northern Rhodesia (now Zambia). Shortly after Rhodes' disastrous Jameson Raid on the South African Republic, the Ndebele rebelled against their white rulers, led by their charismatic religious leader, Mlimo. The Second Matabele War lasted until 1897, when Mlimo was assassinated. Shona agitators also staged unsuccessful revolts (known as Chimurenga) against company rule during 1896 and 1897. Following these failed insurrections, the Ndebele and Shona groups were finally subdued by the Rhodes administration, which organised the land with a disproportionate bias favouring Europeans, thus displacing many indigenous peoples. Southern Rhodesia became a self-governing British colony in October 1923, subsequent to a 1922 referendum. Rhodesians of all races served on behalf of the United Kingdom during the two World Wars. Proportional to the white population, Southern Rhodesia contributed more per capita to both the First and Second World Wars than any other part of the Empire, including Britain itself. After the Unilateral declaration of independence (UDI), the British government petitioned the United Nations for exiled Zimbabweans. Because the internet is currently unrestricted, many Zimbabweans are allowed to access online news sites set up by exiled journalists. Reporters Without Borders claims the media environment in Zimbabwe involves "surveillance, threats, imprisonment, censorship, blackmail, abuse of power and denial of justice are all brought to bear to keep firm control over the news." The main published newspapers are The Herald and The Chronicle which are printed in Harare and Bulawayo respectively. The heavy-handedness on the media has progressively relaxed since 2009. In its 2008 report, Reporters Without Borders ranked the Zimbabwean media as 151st out of 173. The government also bans many foreign broadcasting stations from Zimbabwe, including the BBC (since 2001), CNN, CBC, Sky News, Channel 4, American Broadcasting Company, Australian Broadcasting Corporation (ABC) and Fox News. News agencies and newspapers from other Western countries and South Africa have also been banned from the country. Baden-Powell's drawing of Chief of Scouts Burnham, Matobo Hills, 1896. It was in the Matabeleland region in Zimbabwe that, during the Second Matabele War, Robert Baden-Powell, the founder of Scouting, and Frederick Russell Burnham, the American born Chief of Scouts for the British Army, first met and began their lifelong friendship. 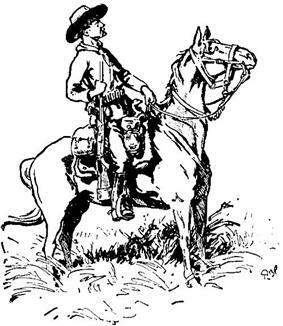 In mid-June 1896, during a scouting patrol in the Matobo Hills, Burnham began teaching Baden-Powell woodcraft. Baden-Powell and Burnham discussed the concept of a broad training programme in woodcraft for young men, rich in exploration, tracking, fieldcraft, and self-reliance. It was also during this time in the Matobo Hills that Baden-Powell first started to wear his signature campaign hat like the one worn by Burnham. Besides scouting, there are also leadership, life skills and general knowledge courses and training experiences mainly for school children ranging from pre-school to final year high school students and some times those beyond High school. These courses and outings, are held at places like Lasting Impressions (Lasting Impressions ~Zimbabwe on YouTube), Far and Wide Zimbabwe (Far and wide.) and Chimanimani Outward Bound (Outwardbound Zimbabwe at the Wayback Machine (archived 16 June 2007)), Just to name a few. The National Anthem of Zimbabwe is "Blessed be the Land of Zimbabwe" (Shona: "Simudzai Mureza wedu WeZimbabwe"; Northern Ndebele: "Kalibusiswe Ilizwe leZimbabwe"). It was introduced in March 1994 after a nation-wide competition to replace "Ishe Komborera Africa" as a distinctly Zimbabwean song. The winning entry was a song written by Professor Solomon Mutswairo and composed by Fred Changundega. It has been translated into all three of the main languages of Zimbabwe. At independence, the policies of racial inequality were reflected in the disease patterns of the black majority. The first five years after independence saw rapid gains in areas such as immunisation coverage, access to health care, and contraceptive prevalence rate. Zimbabwe was thus considered internationally to have an achieved a good record of health development. The country suffered occasional outbreaks of acute diseases (such as plague in 1994). The gains on the national health were eroded by structural adjustment in the 1990s, the impact of the HIV/AIDS pandemic and the economic crisis since the year 2000. Zimbabwe now has one of the lowest life expectancies on Earth – 44 for men and 43 for women, down from 60 in 1990. The rapid drop has been ascribed mainly to the HIV/AIDS pandemic. 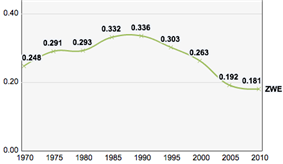 Infant mortality has risen from 6% in the late 1990s to 12.3% by 2004. The health system has more or less collapsed. By the end of November 2008, three of Zimbabwe's four major hospitals had shut down, along with the Zimbabwe Medical School, and the fourth major hospital had two wards and no operating theatres working. Due to hyperinflation, those hospitals still open are not able to obtain basic drugs and medicines. The ongoing political and economic crisis also contributed to the emigration of the doctors and people with medical knowledge. Parsons, Neil (1993). A New History of Southern Africa (2nd ed.). London: Macmillan. ^ a b c d The following languages, namely Chewa, Chibarwe, English, Kalanga, Koisan, Nambya, Ndau, Ndebele, Shangani, Shona, sign language, Sotho, Tonga, Tswana, Venda and Xhosa, are the officially recognised languages of Zimbabwe. (CONSTITUTION OF ZIMBABWE (final draft)). ^ a b "Census Results in Brief". Zimbabwe National Statistical Agency. Retrieved 25 August 2013. ^ a b c d "Zimbabwe". International Monetary Fund. Retrieved 24 April 2012. ^ "Currency in Zimbabwe". GreenwichMeanTime.com. Greenwich 2000. Retrieved 31 July 2013. ^ Hungwe, Brian. (6 February 2014) BBC News – Zimbabwe’s multi-currency confusion. Bbc.com. Retrieved on 26 May 2014. ^ a b c Nelson, Harold (1983). Zimbabwe: A Country Study. The Studies. pp. 1–317. ^ "Country Profiles". Infoplease.com. Retrieved 20 August 2014. ^ Hartnack, Michael (2005). "40 years in wilderness after UDI declaration". The Herald. Archived from the original on 20 March 2006. Retrieved 14 May 2013. ^ Dowden, Richard (2010). Africa: Altered States, Ordinary Miracles. Portobello Books. pp. 144–157. ^ Brunner, Borgna (ed.). TIME Almanac 2004 (2004 ed.). Pearson Education, Inc. pp. 904–905. ^ Lafon, Michel (1994). "Shona Class 5 revisited: a case against *ri as Class 5 nominal prefix". Zambezia 21: 51–80. ^ Vale, Lawrence J. (1999). "Mediated monuments and national identity". Journal of Architecture 4 (4): 391–408. ^ "What's in a Name? Welcome to the 'Republic of Machobana'". Read on (Harare: Training Aids Development Group): 40. 1991. ^ a b Hall, Martin; Stephen W. Silliman (2005). Historical Archaeology. Wiley Blackwell. pp. 241–244. ^ "So Who Was Shaka Zulu- Really?". The Odyssey. Retrieved 14 December 2008. ^ Hensman, Howard (1901). Cecil Rhodes: A Study of a Career. pp. 106–107. ^ a b c Parsons, pp. 178–181. ^ Bryce, James (2008). Impressions of South Africa. p. 170, ISBN 055430032X. ^ Gray, J. A. (1956). "A Country in Search of a Name". The Northern Rhodesia Journal 3 (1): 78. ^ Palamarek, Ernie (2006). Hatari, Trafford Publishing. p. 132, ISBN 1412018269. ^ a b Moorcraft, Paul (31 August 1990). "Rhodesia's War of Independence". History Today 40 (9). [P]er head of (white) population Rhodesia had contributed more in both world wars than any other part of the empire, including the United Kingdom. ... There is little doubt now that after a few resignations here and there, the army, the Royal Navy and even the Royal Air Force (supposedly the most disaffected service) would have carried out any orders to subdue the first national treason against the Crown since the American War of Independence. ^ a b Hastedt, Glenn P. (2004) Encyclopedia of American Foreign Policy, Infobase Publishing, p. 537, ISBN 143810989X. ^ a b Chung, Fay (2006). Re-living the Second Chimurenga: memories from the liberation struggle in Zimbabwe, Preben (INT) Kaarsholm. p. 242, ISBN 9171065512. ^ Preston, Matthew (2004). Ending Civil War: Rhodesia and Lebanon in Perspective. p. 25, ISBN 1850435790. ^ Zimbabwe, May 1980 / Joint Committee on Foreign Affairs and Defence, Canberra : Government Printer, 1980. p122. ^ a b Nyarota, Geoffrey (2006). Against the Grain, Zebra, p. 134, ISBN 1770071121. ^ "Zimbabwe: 1990 General Elections". EISA. Retrieved 9 December 2008. ^ "A Brief History of Zimbabwe". ^ "Zimbabwe: ZANU PF hegemony and its breakdown (1990–1999)". EISA. Retrieved 9 December 2008. ^ "Council Common Position renewing restrictive measures against Zimbabwe". Council of the European Union. 26 January 2009. ^ "Individuals and entities from Zimbabwe on US sanctions list". US Treasury OFAC. 25 July 2008. ^ Archived 10 June 2008 at the Wayback Machine, HumanRightsFirst.org, 8 December 2003. ^ "Zimbabwe: Housing policy built on foundation of failures and lies, Amnesty International, 9 August 2006". Web.archive.org. Archived from the original on 10 October 2006. Retrieved 30 December 2013. ^ Jacobson, Celean (24 November 2008). "Carter warns situation appears dire in Zimbabwe". Associated Press. ^ "Mugabe wants sanctions removed". UPI.com. 18 December 2010. Retrieved 21 August 2011. ^ Booysen, Susan (4 March 2011). ﻿Changing Perceptions in Zimbabwe – Nationwide Survey of the Political Climate in Zimbabwe November 2010 – January 2011﻿ (Report). Freedom House. http://www.kubatana.net/docs/demgg/fh_changing_perceptions_political%20_110304.pdf. Retrieved 16 February 2012. ^ ﻿OCHA in 2012–2013: Plan and Budget: Zimbabwe﻿ (Report). United Nations . Retrieved 16 February 2012. ^ Chinaka, Cris (17 January 2013). "Mugabe deputy John Nkomo dies after cancer battle". Reuters.com. Retrieved 30 December 2013. ^ Dzirutwe, MacDonald. "Zimbabweans start voting to adopt new constitution". Reuters. Retrieved 16 March 2013. ^ a b Baughan, M. (2005). Continent in the Balance: Zimbabwe-Juvenile literature. Philadelphia, PA: Mason Crest Publishers, ISBN 1590848101. ^ Chipika, J; Kowero, G. (2000). "Deforestation of woodlands in communal areas of Zimbabwe: is it due to agricultural policies?". Agriculture, Ecosystems & Environment 79 (2–3): 175. ^ "'"Zimbabwe stands 'on a precipice. BBC News. 31 March 2008. Retrieved 6 June 2012. ^ "Mugabe rival quits election race". BBC News (BBC News). 22 June 2008. ^ a b Latham, Brian (4 March 2002). "Contrast in styles as contenders hold rallies in Harare townships". The Independent (UK). 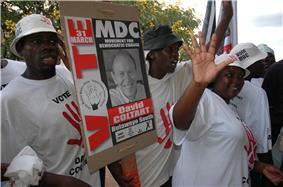 ^ Zimbabwe’s MDC factions reunite at the Wayback Machine (archived 2 May 2008), SABC News, 28 April 2008. ^ Chinaka, Cris (29 April 2008) All eyes on Zim as ZEC wrap-up recount, Reuters (IOL). 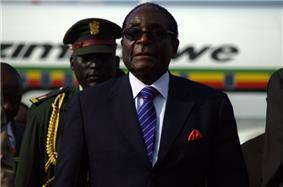 ^ "Aid Group Says Zimbabwe Misused $7.3 Million". Nytimes.com. 3 November 2008. ^ "ZANLA cadre exhumed in Chibondo". Zbc.co.zw. 14 August 2011. Retrieved 30 December 2013. ^ a b "Zimbabwe mass grave used as political propaganda – World – CBC News". Cbc.ca. 31 March 2011. Retrieved 30 December 2013. ^ "Zimbabwe: Mass grave bodies must be exhumed by forensic experts". Amnesty.org. 6 April 2011. Retrieved 30 December 2013. ^ "Zimbabwe – Events of 2006". Human Rights Watch. Retrieved 2 December 2007. ^ Wines, Michael (7 February 2004). "Zimbabwe: Newspaper Silenced". New York Times. Retrieved 6 June 2012. ^ Al Jazeera kicked out of Zimbabwe at the Wayback Machine (archived 2 July 2008), Zimbabwe Metro (22 June 2008). ^ "Provincial Councils and Administration Act (Chapter 29:11)" (PDF). Parliament of Zimbabwe. Retrieved 19 December 2008. ^ "Rural District Councils Act (Chapter 29:13)" (PDF). Parliament of Zimbabwe. Retrieved 19 December 2008. ^ "Traditional Leaders Act (Chapter 29:17)" (PDF). Parliament of Zimbabwe. Retrieved 19 December 2008. ^ "Diamond company in trouble with Harare MPs", iol.co.za, 2 February 2010. ^ "Diamonds in the rough, report by Human Rights Watch". Hrw.org. 26 June 2009. Retrieved 6 June 2012. 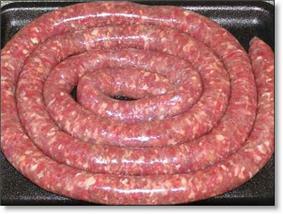 ^ "Zimbabwe-South Africa economic relations since 2000". Africa News. 31 October 2007. Retrieved 3 December 2007. Zimbabwe remains South Africa's most important trading partner in Africa. ^ Zimbabwe Ranked Fastest growing Internet Market. Biztechafrica.com (10 August 2011). Retrieved on 4 July 2013. ^ Why ICT is critical in ‘illiterate’ Africa | BiztechAfrica Business, Telecom, Technology & IT News Africa. Biztechafrica.com (3 December 2012). Retrieved on 4 July 2013. ^ Boucher, Richard (2 March 2004). "Zimbabwe: Sanctions Enhancement" (Press release). ^ Hove, Mediel (2012). "The Debates and Impact of Sanctions: The Zimbabwean Experience". International Journal of Business and Social Science 3 (5): 72–84. ^ Richardson, Craig J. "The loss of property rights and the collapse of Zimbabwe" (PDF) 25. Cato Journal. pp. 541–565. Retrieved 10 November 2010. ^ Organised Violence and Torture in Zimbabwe in 1999 at the Wayback Machine (archived 2 June 2010), 1999. Zimbabwe Human Rights NGO Forum. ^ Zimbabwe President Mugabe labels white farmers 'enemies' at the Wayback Machine (archived 29 June 2006). CNN (18 April 2000). ^ Robinson, Simon (18 February 2002). "A Tale of Two Countries". Time Magazine. ^ "Zimbabwe forbids white farmers to harvest". Usatoday.com. 24 June 2002. Retrieved 6 June 2012. ^ "White farmers under siege in Zimbabwe". BBC News. 15 August 2002. Retrieved 6 June 2012. ^ Mugabe Interview: The Full Transcript. News.sky.com (24 May 2004). Retrieved on 4 July 2013. ^ Clemens, Michael; Moss, Todd (20 July 2005). ﻿Costs and Causes of Zimbabwe's Crisis﻿ (Report). . Retrieved 4 April 2011. ^ Meldrum, Andrew (21 May 2005). "As country heads for disaster, Zimbabwe calls for return of white farmers". The Guardian (London). Retrieved 4 April 2011. ^ Timberg, Craig (6 January 2007). "White Farmers Given Leases in Zimbabwe". Washington Post. Retrieved 4 April 2011. ^ "Zimbabwe threatens white farmers". Washington Post. ^ Chinaka, Cris (8 August 2007). "Zimbabwe threatens white farmers on evictions". ^ "How to stay alive when it all runs out, 12 July 2007". Economist.com. 12 July 2007. Retrieved 6 June 2012. 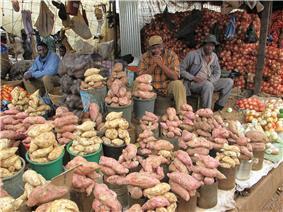 ^ "Zimbabwe inflation hits 11,200,000 percent". CNN. 19 August 2008. Retrieved 19 August 2008. ^ "Zimbabwe introduces 100-billion-dollar note". ^ Dube, Jennifer (3 April 2011). "Zimplats ignores seizure threat". The Standard (Zimbabwe). Archived from the original on 11 May 2011. Retrieved 4 April 2011. ^ "IMARA: Global investors get upbeat briefing on Zim prospects" (Press release). ^ Kitsepile, Nyathi (30 January 2013) Zimbabwe has only $217 in the bank, says finance minister: News. Africareview.com. Retrieved on 4 July 2013. ^ Zimbabwe Claims Its Accounts Are Bare. Newsmax.com (30 January 2013). Retrieved on 4 July 2013. ^ Berger, Sebastien (29 October 2007). "British Airways abandons flights to Zimbabwe". The Daily Telegraph (London). Archived from the original on 30 November 2007. Retrieved 16 November 2007. ^ "Zimbabwe: The Spirit of Matobo". zimbabwe.safari.co.z. ^ The World Health Organization (2007). "Annex Table 1—Basic indicators for all Member States". The World Health Report 2006 (PDF). Geneva: World Health Organization. ^ Thornycroft, Peta (10 April 2006). "In Zimbabwe, life ends before 40". Sydney Morning Herald (Harare). Retrieved 10 April 2006. ^ "Zimbabwe". Retrieved 22 January 2008. ^ Zimbabwe Demographic and Health Survey 2005–06. zimstat.co.zw. ^ Meldrum, Andrew (1 July 2007). "The Observer"Refugees flood from Zimbabwe . The Guardian (London). Retrieved 6 April 2010. 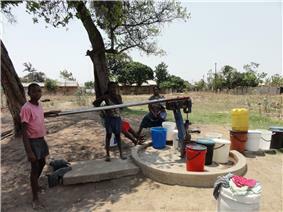 ^ "Sokwanele Civic Action Group"Zimbabwean refugees suffer in Botswana and South Africa . ^ a b c d ""Displacement Monitoring Centre (IDMC), Internal displacement in Zimbabwe. ^ Tibaijuka, A.K. (2005). "Report of the Fact-Finding Mission to Zimbabwe to assess the Scope and Impact of Operation Murambatsvina" (PDF). Geneva: UN Special Envoy on Human Settlements Issues in Zimbabwe. Archived from the original on 27 July 2005. Retrieved 13 April 2009. ^ Owomoyela, Oyekan (2002). Culture and Customs of Zimbabwe. Westport, Conn.: Greenwood Press. p. 77. ^ "Cultural Origins of art". Archived from the original on 4 November 2007. Retrieved 6 January 2008. ^ Stephanie Hanes (20 September 2006). "Biltong: much more than just a snack". ^ "2004 Olympic Games swimming results". CNN. Retrieved 22 July 2007. ^ Gold, Jack Of (29 May 2012). "Africa punching above it's weight in golf". Free TV 4 Africa. Retrieved 6 June 2012. ^ Williams, Jon (29 July 2009). "Resuming operations in Zimbabwe". Bbc.co.uk. ^ Banya, Nelson (26 May 2010). "Zimbabwe licenses new private newspapers". Reuters.com. ^ Chinaka, Cris (4 June 2010). "Zimbabwe gets first private daily newspaper in years". Reuters.com. ^ "Finally, Zimbabwe’s ‘private’ radio station goes on air". Retrieved 1 June 2014. ^ a b c "Reporters without Borders Press Freedom Index". Rsf.org. Archived from the original on 1 November 2008. Retrieved 28 March 2010. ^ Ruzengwe, Blessing (Mach 17, 2005) "The nine lives of Wilf Mbanga", The London Globe via Metrovox. ^ van Wyk, Peter (2003). Burnham: King of Scouts. Trafford Publishing. ^ "Zimbabwe Scouts celebrate their centenary in a park that Baden-Powell had visited in 1936". Retrieved 26 August 2009. ^ Huffman, Thomas N. (1985). "The Soapstone Birds from Great Zimbabwe". African Arts 18 (3): 68–73, 99–100. ^ Sinclair, Paul (2001). "Review: The Soapstone Birds of Great Zimbabwe Symbols of a Nation by Edward Matenga". The South African Archaeological Bulletin 56 (173/174): 105–106. ^ Davies, R. and Sanders, D. (1998). "Adjustment policies and the welfare of children: Zimbabwe, 1980–1985". In: Cornia, G.A., Jolly, R. and Stewart, F. (Eds.) Adjustment with a human face, Vol. II: country case studies. Clarendon Press, Oxford, pp. 272–99, ISBN 0198286112. ^ Dugbatey, K. (1999). "National health policies: sub-Saharan African case studies (1980–1990)". Soc. Sci. Med. 49 (2): 223–239. ^ Marquette, C.M. (1997). "Current poverty, structural adjustment, and drought in Zimbabwe". World Development 25 (7): 1141–1149. ^ "Zimbabwe declares cholera outbreak a national emergency". AFP. 4 December 2008. Retrieved 4 December 2008. ^ "The State of the World's Midwifery". United Nations Population Fund. Retrieved August 2011. ^ ﻿Poverty Income Consumption and Expenditure Survey 2011/12 Report﻿ (Report). Zimstat. 2013. http://web.archive.org/web/20130927163223/http://www.undp.org.zw/component/docman/doc_download/230-zimbabwe-poverty-report-2011-april-17-2013. ^ a b "Zimbabwe US Embassy". Retrieved 15 November 2007. The wealthier portion of the population usually send their children to independent schools as opposed to the government-run schools which are attended by the majority as these are subsidised by the government. School education was made free in 1980, but since 1988, the government has steadily increased the charges attached to school enrolment until they now greatly exceed the real value of fees in 1980. The Ministry of Education of Zimbabwe maintains and operates the government schools but the fees charged by independent schools are regulated by the cabinet of Zimbabwe. Due to large investments in education since independence Zimbabwe has the highest adult literacy rate in Africa which in 2013 was 90.70%. This is lower than the 92% recorded in 2010 by the United Nations Development Programme and the 97.0% recorded in the 2002 census, while still substantially higher than 80.4% recorded in the 1992 census. The education department has stated that 20,000 teachers have left Zimbabwe since 2007 and that half of Zimbabwe's children have not progressed beyond primary school. In June 2011, the United Nations Population Fund released a report on The State of the World's Midwifery. It contained new data on the midwifery workforce and policies relating to newborn and maternal mortality for 58 countries. The 2010 maternal mortality rate per 100,000 births for Zimbabwe is 790. This is compared with 624.3 in 2008 and 231.8 in 1990. The under 5 mortality rate, per 1,000 births is 93 and the neonatal mortality as a percentage of under 5's mortality is 32. The aim of this report is to highlight ways in which the Millennium Development Goals can be achieved, particularly Goal 4 – Reduce child mortality and Goal 5 – improve maternal health. In Zimbabwe the number of midwives per 1,000 live births is unavailable and the lifetime risk of death for pregnant women 1 in 42. The media of Zimbabwe is now once again diverse, having come under tight restriction between 2002 and 2008 by the government during the growing economic and political crisis in the country. The Zimbabwean constitution promises freedom of the media and expression. Since the appointment of a new media and information minister in 2013 the media is currently facing less political interference and the supreme court has ruled some sections of the strict media laws as unconstitutional. In July 2009 the BBC and CNN were able to resume operations and report legally and openly from Zimbabwe. CNN welcomed the move. The Zimbabwe Ministry of Media, Information and Publicity stated that, "the Zimbabwe government never banned the BBC from carrying out lawful activities inside Zimbabwe". The BBC also welcomed the move saying, "we're pleased at being able to operate openly in Zimbabwe once again". Other sports played in Zimbabwe are basketball, volleyball, netball, and water polo, as well as squash, motorsport, martial arts, chess, cycling, polocrosse, kayaking and horse racing. However, most of these sports don't have international representatives but instead stay at a junior or national level. Notable cricket players from Zimbabwe includes Andy Flower, the former coach of the England Cricket Team. Football is the most popular sport in Zimbabwe, although rugby union and cricket also have a following, traditionally among the white minority. Zimbabwe has won eight Olympic medals, one in field hockey at the 1980 Summer Olympics in Moscow, and seven in swimming, three at the 2004 Summer Olympics and four at the 2008 Summer Olympics, all by Kirsty Coventry. Since Zimbabwe was a British colony, some people there have adopted some colonial-era English eating habits. For example, most people will have porridge in the morning, as well as 10 o'clock tea (midday tea). They will have lunch, often leftovers from the night before, freshly cooked sadza, or sandwiches (which is more common in the cities). After lunch, there is usually 4 o'clock tea that is served before dinner. It is not uncommon for tea to be had after dinner. Several authors are well known within Zimbabwe and abroad. Charles Mungoshi is renowned in Zimbabwe for writing traditional stories in English and in Shona and his poems and books have sold well with both the black and white communities. Catherine Buckle has achieved international recognition with her two books African Tears and Beyond Tears which tell of the ordeal she went through under the 2000 Land Reform. Prime Minister of Rhodesia, the late Ian Smith, has also written two books – The Great Betrayal and Bitter Harvest. The book The House of Hunger by Dambudzo Marechera won an award in the UK in 1979 and the Nobel Prize-winning author Doris Lessing's first novel The Grass Is Singing, the first four volumes of The Children of Violence sequence, as well as the collection of short stories African Stories are set in Rhodesia. In 2013 NoViolet Bulawayo's novel We Need New Names was shortlisted for the Booker Prize. The novel tells the story of the devastation and emigration caused by the brutal suppression of Zimbabwean civilians during the Gukurahundi in the early 1980s. Shona sculpture in essence has been a fusion of African folklore with European influences. World renowned Zimbabwean sculptors include Nicholas, Nesbert and Anderson Mukomberanwa, Tapfuma Gutsa, Henry Munyaradzi and Locardia Ndandarika. Internationally, Zimbabwean sculptors have managed to influence a new generation of artists, particularly Black Americans, through lengthy apprenticeships with master sculptors in Zimbabwe. Contemporary artists like New York sculptor M. Scott Johnson and California sculptor Russel Albans have learned to fuse both African and Afro-diasporic aesthetics in a way that travels beyond the simplistic mimicry of African Art by some Black artists of past generations in the United States. Traditional arts in Zimbabwe include pottery, basketry, textiles, jewellery and carving. Among the distinctive qualities are symmetrically patterned woven baskets and stools carved out of a single piece of wood. Shona sculpture has become world famous in recent years having first emerged in the 1940s. Most subjects of carved figures of stylised birds and human figures among others are made with sedimentary rocks such as soapstone, as well as harder igneous rocks such as serpentine and the rare stone verdite. Some of these Zimbabwean artefacts being found in countries like Singapore, China and Canada. i.e. Dominic Benhura's statue in the Singapore botanic gardens. 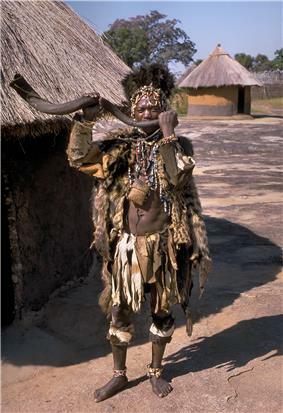 Zimbabwe has many different cultures which may include beliefs and ceremonies, one of them being Shona. Zimbabwe's largest ethnic group is Shona. The Shona people have many sculptures and carvings which are made with the finest materials available. The economic meltdown and repressive political measures in Zimbabwe have led to a flood of refugees into neighbouring countries. An estimated 3.4 million Zimbabweans, a quarter of the population, had fled abroad by mid-2007. Some 3 million of these have gone to South Africa and Botswana. Minority ethnic groups include white Zimbabweans, who make up less than 1% of the total population. 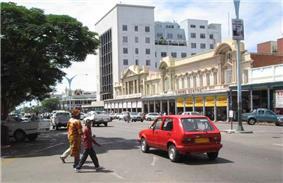 White Zimbabweans are mostly of British origin, but there are also Afrikaner, Greek, Portuguese, French and Dutch communities. The white population dropped from a peak of around 278,000 or 4.3% of the population in 1975 to possibly 120,000 in 1999 and was estimated to be no more than 50,000 in 2002, and possibly much less. Most emigration has been to the United Kingdom (between 200,000 and 500,000 Britons are of Rhodesian or Zimbabwean origin), South Africa, Botswana, Zambia, Canada, Australia and New Zealand. Coloureds form 0.5% of the population, and various Asian ethnic groups, mostly of Indian and Chinese origin, are also 0.5%. Bantu-speaking ethnic groups make up 98% of the population. The majority people, the Shona, comprise 70%. The Ndebele are the second most populous with 20% of the population. The Ndebele descended from Zulu migrations in the 19th century and the other tribes with which they intermarried. Up to one million Ndebele may have left the country over the last five years, mainly for South Africa. Other Bantu ethnic groups make up the third largest with 2 to 5%: these are Venda, Tonga, Shangaan, Kalanga, Sotho, Ndau, Nambya, Tswana, Xhosa and Lozi. Some 85% of Zimbabweans are Christian; 62% of the population attends religious services regularly. The largest Christian churches are Anglican, Roman Catholic, Seventh-day Adventist and Methodist. As in other African countries, Christianity may be mixed with enduring traditional beliefs. Besides Christianity, ancestral worship is the most practised non-Christian religion, involving spiritual intercession; the Mbira Dza Vadzimu, which means "Voice of the Ancestors", an instrument related to many lamellophones ubiquitous throughout Africa, is central to many ceremonial proceedings. Mwari simply means "God the Creator" (musika vanhu in Shona). Around 1% of the population is Muslim. reported a decline in HIV prevalence among pregnant women from 26% in 2002 to 21% in 2004.UNESCO  was estimated to be 14% for people aged 15–49 in 2009.HIV infection rate in Zimbabwe The  An association of doctors in Zimbabwe has made calls for President Mugabe to make moves to assist the ailing health service. According to the United Nations  Zimbabwe's total population is 12.97 million. The Matobo Hills are an area of granite kopjes and wooded valleys commencing some 22 miles (35 km) south of Bulawayo in southern Zimbabwe. The Hills were formed over 2,000 million years ago with granite being forced to the surface, then being eroded to produce smooth "whaleback dwalas" and broken kopjes, strewn with boulders and interspersed with thickets of vegetation. Mzilikazi, founder of the Ndebele nation, gave the area its name, meaning 'Bald Heads'. They have become famous and a tourist attraction due to their ancient shapes and local wildlife. Cecil Rhodes and other early white pioneers like Leander Starr Jameson are buried in these hills at a site named World's View. Several airlines have also pulled out of Zimbabwe. Australia's Qantas, Germany's Lufthansa and Austrian Airlines were among the first to pull out and most recently British Airways suspended all direct flights to Harare. The country's flagship airline Air Zimbabwe, which operated flights throughout Africa and a few destinations in Europe and Asia, ceased operations in February 2012. Many light aircraft charter companies operate in Zimbabwe, providing a quick and safe means of travel in the region. The biggest of these companies is Executive Air. For the past ten years, the  Zimbabwe's commercial farming sector was traditionally a source of exports and foreign exchange, and provided 400,000 jobs. However, the government's land reform program badly damaged the sector, turning Zimbabwe into a net importer of food products. 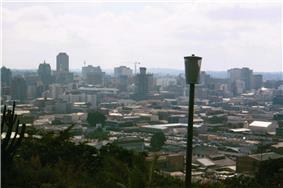 Since the formation of the Unity Government in 2009, the Zimbabwean economy has been on the rebound. GDP grew by more than 5% in the year 2009 and 2011. In November 2010, the IMF described the Zimbabwean economy as "completing its second year of buoyant economic growth". Zimplats, the nation's largest platinum company, has proceeded with US$500 million in expansions, and is also continuing a separate US$2 billion project, despite threats by Mugabe to nationalise the company. The pan-African investment bank IMARA released a favourable report in February 2011 on investment prospects in Zimbabwe, citing an improved revenue base and higher tax receipts. In late January 2013, the Zimbabwean finance ministry reported that they had only $217 in their treasury and would apply for donations to finance the coming elections that is estimated to cost 107 million USD. Inflation rose from an annual rate of 32% in 1998, to an official estimated high of 11,200,000% in August 2008 according to the country's Central Statistical Office. This represented a state of hyperinflation, and the central bank introduced a new 100 billion dollar note. On 29 January 2009, in an effort to counteract runaway inflation, acting Finance Minister Patrick Chinamasa announced that Zimbabweans will be permitted to use other, more stable currencies to do business, alongside the Zimbabwe dollar. In an effort to combat inflation and foster economic growth the Zimbabwean Dollar was suspended indefinitely on 12 April 2009. Zimbabwe now allows trade in the United States Dollar and various other currencies such as the South African rand, euro, Sterling, and Botswana pula. By 2005, the purchasing power of the average Zimbabwean had dropped to the same levels in real terms as 1953. In 2005, the government, led by central bank governor Gideon Gono, started making overtures that white farmers could come back. There were 400 to 500 still left in the country, but much of the land that had been confiscated was no longer productive. In January 2007, the government even let some white farmers sign long term leases. But, at the same time, the government continued to demand that all remaining white farmers, who were given eviction notices earlier, vacate the land or risk being arrested. Mugabe pointed to foreign governments and alleged "sabotage" as the cause of the fall of the Zimbabwean economy, as well as the country's 80% formal unemployment rate. 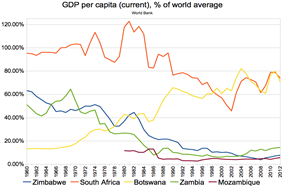 Zimbabwe maintained positive economic growth throughout the 1980s (5% GDP growth per year) and 1990s (4.3% GDP growth per year). The economy declined from 2000: 5% decline in 2000, 8% in 2001, 12% in 2002 and 18% in 2003. Zimbabwe's involvement from 1998 to 2002 in the war in the Democratic Republic of the Congo drained hundreds of millions of dollars from the economy. The downward spiral of the economy has been attributed mainly to mismanagement and corruption by the government and the eviction of more than 4,000 white farmers in the controversial land redistribution of 2000. The Zimbabwean government and its supporters attest that it was Western policies to avenge the expulsion of their kin that sabotaged the economy. Since 1 January 2002, the government of Zimbabwe has had its lines of credit at international financial institutions frozen, through US legislation called the Zimbabwe Democracy and Economic Recovery Act of 2001 (ZDERA). Section 4C instructs the Secretary of the Treasury to direct directors at international financial institutions to veto the extension of loans and credit to the Zimbabwean government. According to the United States, these sanctions target only seven specific businesses owned or controlled by government officials and not ordinary citizens. An independent study has shown that the sanctions have adversely affected the welfare of ordinary citizens. Mineral exports, gold, agriculture, and tourism are the main foreign currency earners of Zimbabwe. The mining sector remains very lucrative, with some of the world's largest platinum reserves being mined by Anglo American plc and Impala Platinum. 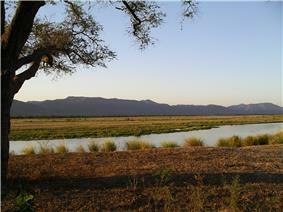 The Marange diamond fields, discovered in 2006, are considered the biggest diamond find in over a century. They have the potential to improve the fiscal situation of the country considerably, but almost all revenues from the field have disappeared into the pockets of army officers and ZANU-PF politicians. In terms of carats produced, the Marange field is one of the largest diamond producing projects in the world, estimated to produce 12 million carats in 2014 worth over $350 million. Zimbabwe is the biggest trading partner of South Africa on the continent. The ZNA was originally formed into four brigades, composed of a total of 28 battalions. The brigade support units were composed almost entirely of specialists of the former Rhodesian Army, while unintegrated battalions of the Rhodesian African Rifles were assigned to the 1st, 3rd and 4th Brigades. The Fifth Brigade was formed in 1981 and disbanded in 1988 after the demonstration of mass brutality and murder during the brigade's occupation of Matabeleland in what has become known as Gukurahundi (Shona: "the early rain which washes away the chaff before the spring rains"), the campaign which finished off Mugabe's liberation struggle. The Brigade had been reformed by 2006, with its commander, Brigadier-General John Mupande praising its "rich history". The Zimbabwe Defence Forces were set up by the integration of three belligerent forces – the Zimbabwe African National Liberation Army (ZANLA), the Zimbabwe People's Revolutionary Army (ZIPRA), and the Rhodesian Security Forces (RSF) – after the Second Chimurenga and Zimbabwean independence in 1980. The integration period saw the formation of The Zimbabwe National Army (ZNA) and Air Force of Zimbabwe (AFZ) as separate entities under the command of Rtd General Solomon Mujuru and Air Marshal Norman Walsh who retired in 1982, and was replaced by Air Marshal Azim Daudpota who handed over command to the late Rtd Air Chief Marshal Josiah Tungamirai in 1985. Police action was strongly condemned by the  While noting that the activists had suffered injuries, but not mentioning the cause of them, the Zimbabwean government-controlled daily newspaper The Herald claimed the police had intervened after demonstrators "ran amok looting shops, destroying property, mugging civilians, and assaulting police officers and innocent members of the public". The newspaper also argued that the opposition had been "willfully violating the ban on political rallies". In 2011, there were reports of 640 corpses having been recovered from the Monkey William Mine in Chibondo. They were allegedly authenticated by the Fallen Heroes Trust of Zimbabwe and the Department of National Museums and Monuments who are leading the exhumation process as victims of the Ian Smith regime during the liberation war. One body was identified as a ZANLA cadre, Cde Rauya, by the Fallen Heroes Trust Chief exhumer. Government Minister, Saviour Kasukuwere admitted the remains were discovered in 2008, but claimed the remains were decades old despite clear evidence the exhumed skeletons still had hair and clothes. But Solidarity Peace Trust, said that the presence of soft tissues "is not necessarily an indicator that these bones entered the grave more recently, although it could be." Journalists found a body in the mine with 'what appeared to be blood and fluids dripping onto the skulls below'. The opposition MDC called for research on all violence that included killings of its supporters during disputed elections in 2008. Amnesty International expressed concern that "international best practice on exhumations is not being adhered to." Adding that, "mishandling of these mass graves has serious implications on potential exhumations of other sites in Zimbabwe. Thousands of civilians were also killed in Matabeleland and Midlands provinces in the mid 1980s and are allegedly buried in mine shafts and mass graves in these regions." The MDC-T, which has become more popular than the other group. The run-off was scheduled for 27 June 2008. On 22 June, citing the continuing unfairness of the process and refusing to participate in a "violent, illegitimate sham of an election process", Tsvangirai pulled out of the presidential run-off, the ZEC held the run-off and President Mugabe received a landslide majority. The official results required a runoff between Mugabe and  General elections were again held in Zimbabwe on 30 March 2008. President Robert Mugabe's Zimbabwe African National Union – Patriotic Front (commonly abbreviated ZANU-PF) has been the dominant political party in Zimbabwe since independence. In 1987 then-prime minister Mugabe revised the constitution, abolishing the ceremonial presidency and the prime ministerial posts to form an executive president, a Presidential system. His ZANU party has won every election since independence, in the 1990 election the second-placed party, Edgar Tekere's Zimbabwe Unity Movement, won only 20% of the vote. During the 1995 parliamentary elections most opposition parties, including the ZUM, boycotted the voting, resulting in a near-sweep by the ruling party. When the opposition returned to the polls in 2000, they won 57 seats, only five fewer than ZANU. Zimbabwe is a republic with a presidential system of government. The semi-presidential system was done away with the adoption of a new constitution after a referendum in March 2013. Under the constitutional changes in 2005, an upper chamber, the Senate, was reinstated. The House of Assembly is the lower chamber of Parliament. Large parts of Zimbabwe were once covered by forests with abundant wildlife. Deforestation and poaching has reduced the amount of wildlife. Woodland degradation and deforestation, due to population growth, urban expansion and lack of fuel, are major concerns. and have led to erosion and land degradation which diminish the amount of fertile soil. 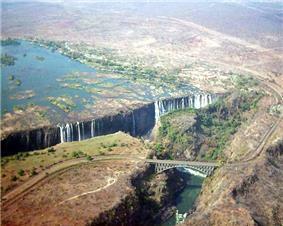 Zimbabwe is a country that relies mostly on hydroelectric power. Zimbabwe had once relied heavily on electricity from Mozambique and other neighbouring countries. 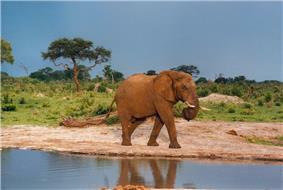 There are around 350 species of mammals that can be found in Zimbabwe. There are also many snakes and lizards, over 500 bird species, and 131 fish species. Zimbabwe is a landlocked country in southern Africa, lying between latitudes 15° and 23°S, and longitudes 25° and 34°E. Most of the country is elevated in the central plateau (high veld) stretching from the southwest to the northwest at altitudes between 1,200 and 1,600 m. The country's east is mountainous with Mount Nyangani as the highest point at 2,592 m. About 20% of the country consists of the low veld under 900m. Victoria Falls, one of the world's biggest and most spectacular waterfalls, is located in the country's northwest as part of the Zambezi river. The country has a tropical climate with a rainy season usually from late October to March. The climate is moderated by the altitude. Zimbabwe is faced with recurring droughts; and severe storms are rare. On 17 January 2013, the Vice-President John Nkomo died of cancer at St Anne's Hospital in Harare, Zimbabwe at the age of 78. A new constitution approved in the Zimbabwean constitutional referendum, 2013 curtails presidential powers and will lead to an election to decide whether Robert Mugabe extends his three-decade rule. In late 2008, problems in Zimbabwe reached crisis proportions in the areas of living standards, public health (with a major cholera outbreak in December) and various basic affairs. In September 2008, a power-sharing agreement was reached between Tsvangirai and President Mugabe, permitting the former to hold the office of prime minister. Due to ministerial differences between their respective political parties, the agreement was not fully implemented until 13 February 2009. By December 2010, Mugabe was threatening to completely expropriate remaining privately owned companies in Zimbabwe unless "western sanctions" were lifted. A 2011 survey by Freedom House suggests that living conditions have improved since the power-sharing agreement. The United Nations Office for the Coordination of Humanitarian Affairs states in its 2012–2013 planning document that the "humanitarian situation has improved in Zimbabwe since 2009, but conditions remain precarious for many people". Following fraudulent elections in 2005, the government initiated "Operation Murambatsvina", an effort to crack down on illegal markets and slums emerging in towns and cities, leaving a substantial section of urban poor homeless. The Zimbabwean government has described the operation as an attempt to provide decent housing to the population, although authorities have yet to properly substantiate their claims. On 29 March 2008, Zimbabwe held a presidential election along with a parliamentary election. The results of this election were withheld for two weeks, after which it was generally acknowledged that the Movement for Democratic Change – Tsvangirai (MDC-T) had achieved a majority of one seat in the lower house of parliament. Charged with committing numerous human rights abuses and running the economy of his own nation into the ground, Mugabe found himself beset with a wide range of sanctions. In 2002, the nation was suspended from the Commonwealth of Nations due to the reckless farm seizures and blatant election tampering. The following year, Zimbabwean officials voluntarily terminated its Commonwealth membership. Land issues re-emerged as the main issue for the ruling party around 1997. Despite the existence of a "willing-buyer-willing-seller" land reform programme since the 1980s, white Zimbabweans continued to hold about 70% of the most arable land. Robert Mugabe began to forcibly redistribute this land to his associates in 2000. Poorly managed confiscation of white farmland (accompanied by brutality and corruption), continuous droughts, and a serious drop in external finance and other supports led to a sharp decline in agricultural exports, which was traditionally the country's leading export-producing sector. Some 58,000 independent black farmers have since experienced limited success in reviving the gutted cash crop sectors through efforts on a smaller scale. Zimbabwean elections in March 1990 resulted in another victory for Mugabe and his party, which claimed 117 of the 120 contested seats. Observers found the campaign to be "neither free nor fair". During the 1990s, students, trade unionists, and workers often demonstrated to express their growing discontent with increasingly despotic Mugabe rule. In 1996, civil servants, nurses, and junior doctors went on strike over salary issues. The general health of the civilian population also began to significantly decline. By 1997 an estimated 25% of the population of Zimbabwe had been infected by HIV. During the elections of February 1980, Robert Mugabe and his ZANU secured a landslide victory. Opposition to what was perceived as a Shona takeover immediately erupted around Matabeleland. The Matabele unrest led to what has become known as 'Gukurahundi' (Shona: "the early rain which washes away the chaff before the spring rains") or the Matabeleland Massacres, which lasted from 1982 until 1985. It has been estimated that at least 20,000 Matabele were murdered and tens of thousands of others were tortured in military internment camps. The slaughter only ended after Nkomo and Mugabe reached a unity agreement in 1987 that merged their respective parties, creating the Zimbabwe African Union-Patriotic Front. On 11 December 1979, the Rhodesian House of Assembly voted 90 to nil to revert to British colonial rule (the 'aye' votes include Ian Smith himself). The bill then passed the Senate and was assented to by the President. With the arrival of Lord Soames, the new Governor, just after 2 p.m. on 12 December 1979, Zimbabwe Rhodesia formally returned to British rule, although on 13 December, Soames declared that during his mandate the name Rhodesia would be used. Britain lifted sanctions on 12 December, and the United Nations on 16 December, before calling on its member states to do likewise on 21 December. Thus Zambia, Mozambique, Tanzania, Angola and Botswana lifted sanctions on 22–23 December; Australia partly pre-empted this, lifting all but trade sanctions on 18 December, and trade sanctions on 21 December. 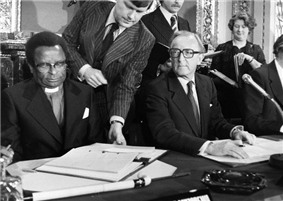 In March 1978, Smith reached an accord with three African leaders, led by Bishop Abel Muzorewa, who offered to leave the white population comfortably entrenched in exchange for the establishment of a biracial democracy. As a result of the Internal Settlement, elections were held in April 1979, concluding with the United African National Council (UANC) carrying a majority of parliamentary seats. On 1 June 1979, Muzorewa, the UANC head, became prime minister and the country's name was changed to Zimbabwe Rhodesia. The internal settlement left control of the police, security forces, civil service and judiciary in settler hands. It also reserved one-third of the seats in parliament for whites. On 12 June, the United States Senate voted to lift economic pressure on the former Rhodesia. 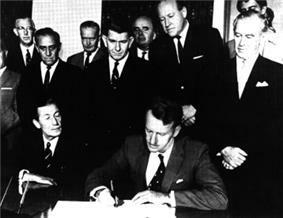 Smith declared Rhodesia a republic in 1970, following the results of a mostly white referendum the previous year, but this went unrecognised internationally. Meanwhile, Rhodesia's internal conflict intensified, eventually forcing him to open negotiations with the militant nationalists. The United Kingdom deemed the Rhodesian declaration an act of rebellion, but did not re-establish control by force. A guerrilla war subsequently ensued when Joshua Nkomo's Zimbabwe African People's Union (ZAPU) and Robert Mugabe's Zimbabwe African National Union (ZANU), supported actively by communist powers and neighbouring African nations, initiated guerilla operations against the white government. ZAPU was supported by the Soviet Union, the Warsaw Pact and associated nations such as Cuba, and adopted a Marxist–Leninist ideology; ZANU meanwhile aligned itself with Maoism and the bloc headed by the People's Republic of China. These sanctions were expanded again in 1968.